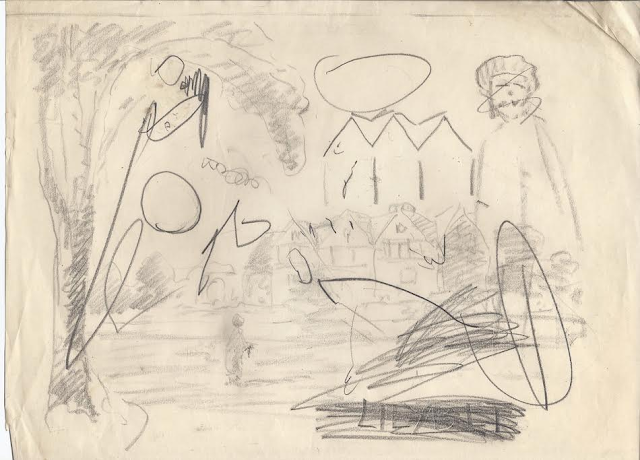 Three previously unknown childhood doodles by Queen Elizabeth II have been put up for sale at JustCollecting.com, along with what is believed to be her earliest known signature. They are thought to be the first drawings by Queen Elizabeth II to appear for sale. Their present owner discovered the drawings by chance at a house clearance sale in Wiltshire, UK. A three-year-old Princess Elizabeth created the pencil doodles in July 1929, during a photo session at society photographer Marcus Adams’ studio in London. The three drawings form just a fragment of a huge collection of documents that track Adams' close relationship with the Royal Family. Adams (1875-1959) was an official photographer of the Royal Family from 1926 to 1956. 1. Elizabeth has drawn on a page containing Adams' name and what is thought to be Adams' sketch of a cat. Adams has annotated the page: "These lines were drawn by Princess Lillybet July 31st 1929" and "Drawn by Marcus Adams July 31st 1929 with the aid of Princess Lillybet in the children's studio, London". 2. Over Adams' sketch of a garden and houses, Princess Elizabeth has added several bold circular lines. 3. Elizabeth has also sketched bold dark lines over a page containing Adams' notes and drawings of animals. · A letter written by nanny Clara Knight to Adams, signed by a three-year-old Princess Elizabeth – possibly the earliest Princess Elizabeth signature in existence. · Adams' notebook, with his personal thoughts on the Royal Family. It includes the following on a young Prince Charles: "A whole volley of questions... this of course he inherited from his father". 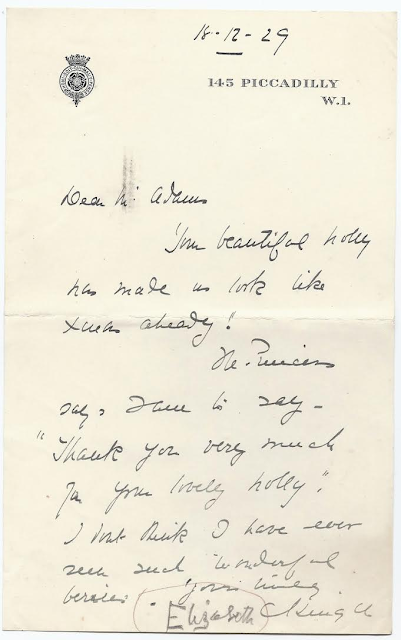 · A Christmas 1933 letter from a seven-year-old Elizabeth, thanking Adams for "the lovely holly you sent me today". · An original 1932 Christmas card featuring an Adams photo of the Duke and Duchess of York (George VI and the Queen Mother), Princess Elizabeth and Princess Margaret. · Correspondence from King George VI to Marcus Adams correcting his use of the Royal Crest. 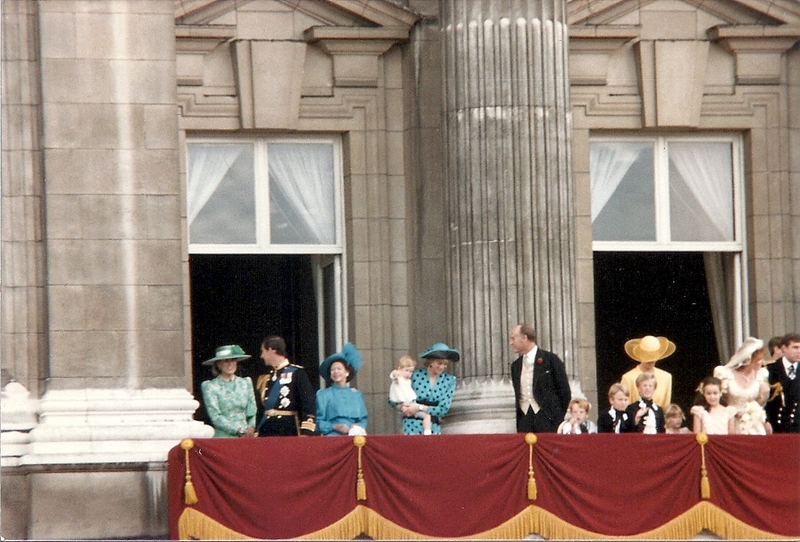 · Several original Adams photographs of the Royal Family, including a baby Princess Elizabeth. The collection includes close to 100 documents in all. JustCollecting's Adrian Roose comments: "These three pieces of paper are like nothing I've seen before. They remind us that behind the protocol, and the grave duty that comes with being Queen, there was once a little girl who loved to draw. "I can see a major royal collector or a museum wanting these." "Any one of these pieces is a thrill to own. Together, they make an exceptional collection – especially when you consider that few people knew they existed until recently." The collection comes with a letter of provenance from the present owner. JustCollecting is welcoming offers in the region of £15,000 ($21,000) for the entire collection. JustCollecting is a community and rewards club for collectors where members can buy, sell, share and manage their collections, earning exclusive reward points to spend on products, discounts and entry to competitions.